You can use the copyfield keyword to make this process very easy. 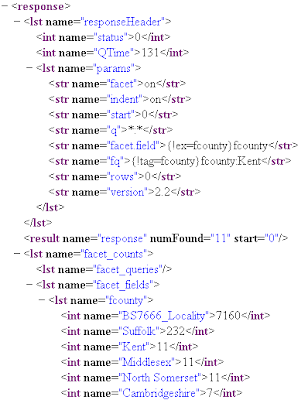 Now, when you index county, Solr will use the text field for searching and the string field for displaying the facet results. First up you'll need to turn on the faceting as it's turned off by default. 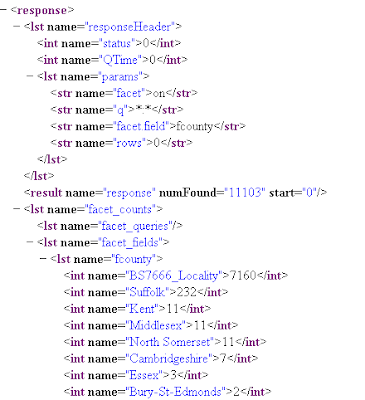 When you apply the above filter you can see that the other counties get a facet count of 0. This is single faceting and works well. To get multifaceting to work you need to tell solr to exclude the filter (fq) when it works out the facet counts. To do this you can use the ex and tag key words. 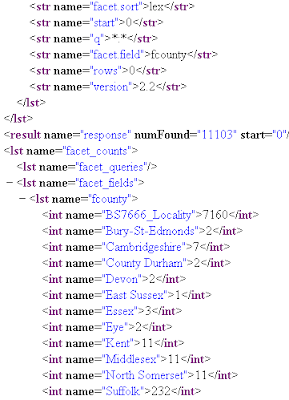 When you do this you'll notice that the counts for the other facet's come back now, and the filter has still been applied to the results (numFound is still 11). 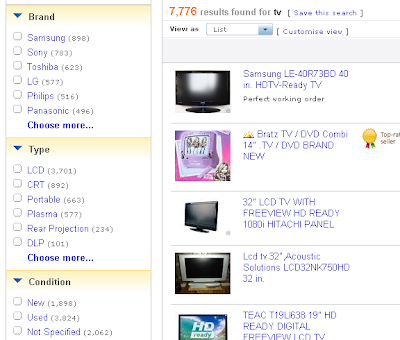 Now using Solr you can create a really rich user experience with searches and give ebay a run for it's money. Enjoy. Great! Saved me some research time on this. Especially helpful with the multifaceting. Thanks N. Glad you liked it. 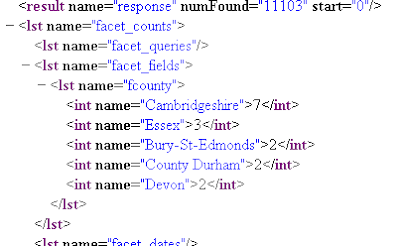 Faceting is great fun.. and it's a really cool way to see what you're index looks like. 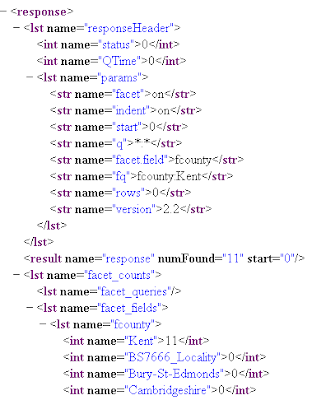 I think it is really useful, but I have several problems to obtain a "distinct" query using faceting. 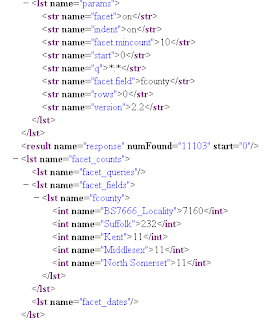 I have made tests with faceting but it doesn't run correctly, I would like to know if is possible to use faceting to make a distinct in a query. Could you help me please????? 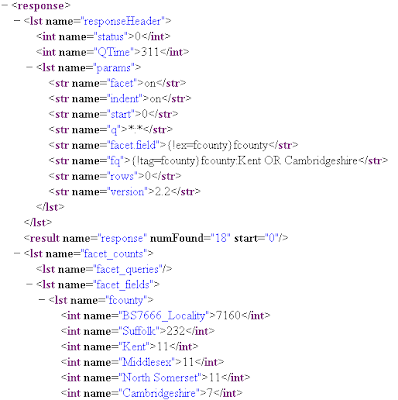 but this isn't the case, because the request to solr doesn't return the field text in any case. Could you help me? any suggestion is grateful. Good to see this blog admin, really helpful to me. Very nice concept. Your post is too good and very helping for improve my knowledge skills. Thank you for worthy post. Awesome post with good piece of information. You are providing a lot of valid information. Keep us updated. Very interesting article. Thanks to the author. وجود أعشاش الحمام على أسطح المنازل يؤدي لانتشار أنواع مختلفة من الحشرات الضارة و إن لم يكن هناك سبب لطرد الحمام سوى جلب الحشرات الضارة لكان هذا السبب كافي لقرار تسريب الحمام للحشرات لأنها العدو الأول لأي مبنى و يعمل الجميع على مكافحتها إذاً حتى لو كنا نعشق الحمام فلا بد من تسريبه من المنزل تجنباً لانتشارها في المنزل وبالرغم من أن العالم كله يعد الحمام رمزاً للسلام و المحبة إلا أن تواجد الحمام بالمنزل له أضرار متعددة و هذا ما يجعل الجميع يلجئ لشركة تركيب طارد الحمام بالمدينة المنورة للمساعدة في التخلص منه بأسرع وقت و نوفر للجميع طوارد الحمام الحديثة للتخلص من وجودة في المنزل نهائياً .